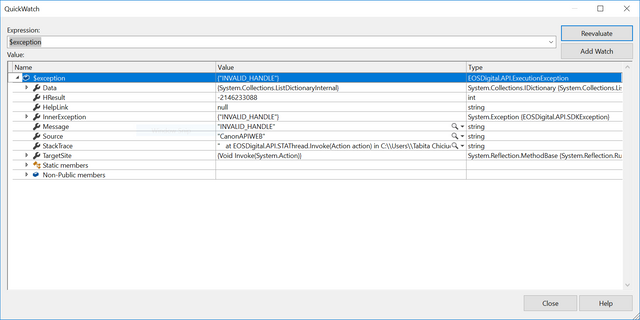 I have a Canon x64 DLL library I use in ASP.NET 4.6.1 WebAPI, which works fine. I can initialize the camera and I can get the live view. Can someone help me troubleshoot this issue? Tried with an WPF Project 4.6.1 x64 and it worked fine... how can I make this work in the WebAPI? I got it working! I put my init code in Get Request and made my Camera object as static. Web API is a web application where code runs on a server in response to a request. You'll need to craft a background task to manage the camera and stop the web app from going idle. Keep in mind the camera must be attached to the server so the solution might not work in a production environment. Can you explain your project requirements? WPF is the appropriate technology.